On Thursday 20th October, Steve Parsons and Rod Littlewood attended the official launch of Movember in Shoreditch, meeting up with friends from the past and present Movember campaigns. 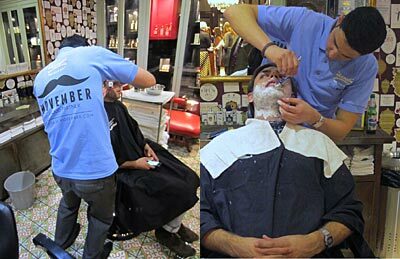 After bumping into a group of guys on a pub crawl in the Windsor Castle at the First Friday in October, on Wednesday 26th The Handlebar Club were proud to support the recent launch of the London Business School�s Movember campaign at their headquarters near Regent�s Park in London. Rod Littlewood and Conrad Amis were in attendance to lend whiskery support to the intrepid volunteers, with the former giving a talk on the rules of Movember and the significance behind the campaign to improve men�s health. 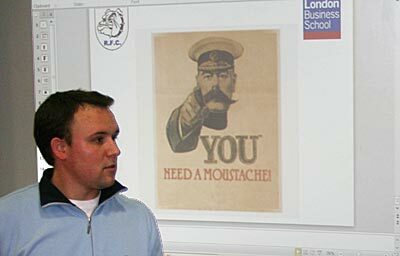 In 2010 the LBS raised over £16,000 for Movember and are hoping to do even better this year, so here�s wishing them every success in their endeavours. On Friday 28th October Steve Parsons, Conrad Amis and Rod Littlewood attended the official Movember �shave down� at Penhaligon's in Covent Garden, again meeting up with members of the Movember team and the Prostate Cancer Charity Chief Executive. At the November First Friday, a reporter and photographer from The Times Newspaper, and a reporter from the BBC World Service attended to chat to members about Movember. 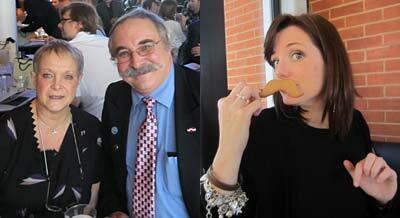 Steve, Keri, Rod, Geoff and 'Dame Judy' attended the Movember Long Lunch at the OXO Tower on Friday 18th November. 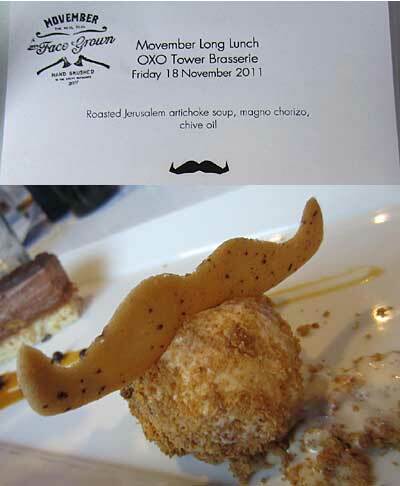 The Long Lunch began and ended with a moustache; not an OXO cube in sight. Here are some familiar diners at the OXO Long Lunch which was of course not a freebie but a £40 per head Movember fundraiser! 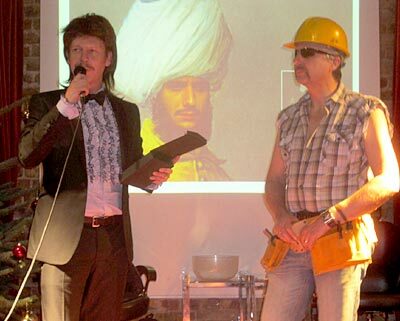 Conrad, Steve and Rod were invited to the Movember Gala Party in London on November 25th to judge the Ultimate Mo category. 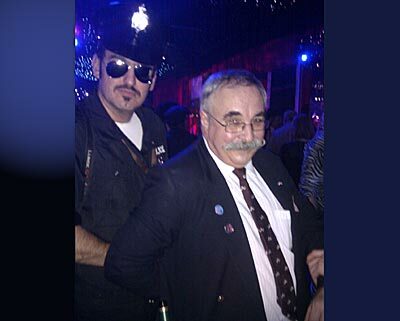 Rod was a very naughty boy and got himself arrested! Conrad Amis appears at 1 min in this Movember video by Crane TV. November's feverish Movember upper lip activities saw Club Committee member Atters Attree officiating at various end of Movember fund raising events including The Rock Inn in Brighton (where staff and locals raised almost £3,000) and as an official Judge for the end of Movember�s Brighton Gala party (held at Sticky Mike's Frog Bar). 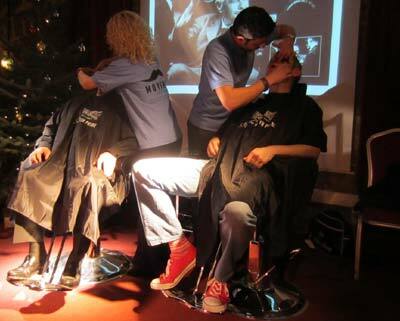 Here Atters was joined by Club committee member Tom Cutler to judge the proceedings which were of course being held around the world to thank the �Mo Bros and Mo Sistas� for helping to raise awareness and cash. Naturally Atters volunteered as a judge of the female contenders only (those who had raised money, dressed interestingly or had a nice smile). The evening closed with Atters, Tom and the touring Movember �big-wig� officials (some from Movember�s Australian HQ itself) presenting numerous celebratory accolades at the end. It was standing room only on Thursday 1st December as Rod and Conrad returned to the London Business School for the final awards ceremony. 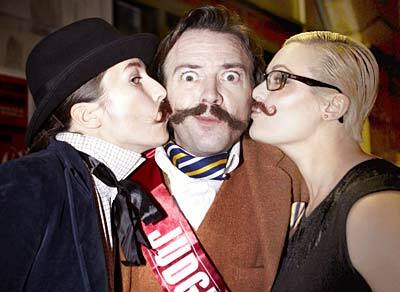 Ably assisted by Pablo from Movember, we scrutinised ten sets of whiskers before selecting two finalists. 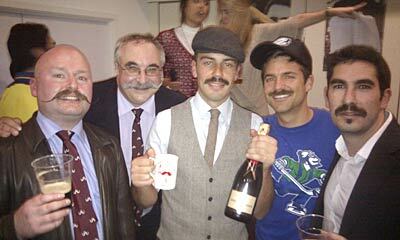 The lively audience voted Derek Senft (below centre) as winner, seen here proudly displaying a Handlebar Club mug, as well as a bottle of something to drink from it. We�re pleased to announce that the LBS smashed their previous record, raising over £20,000 for this fine cause and finishing in the top ten teams across the UK. 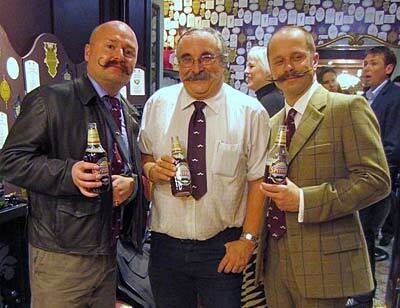 The Handlebar Club would like to congratulate everyone involved and we hope to see you again next Movember. 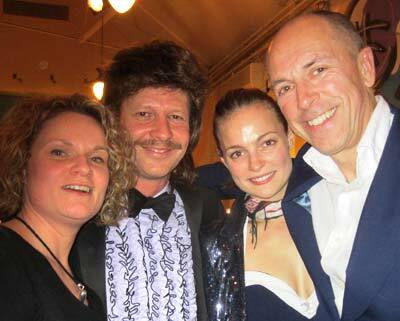 On the last night of the month of Movember 'Prez' Rod Littlewood went down to Epsom, Surrey to judge a few Mos at the office of TWM Solicitors. They have raised about £1600 between them. 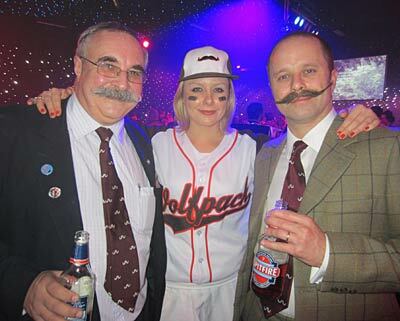 On November 30th I attended the Fuller's Brewery Movember Party and moustache competition. Hundreds of Fullers employees across London and the South East have being growing moustaches and raising money all month and dozens of their pubs have been holding special Movember events to add to their fundraising total. They were all very proud to hear that over £32,000 has been raised by their efforts - apparently more than the total for the whole of France! What a magnificent effort. 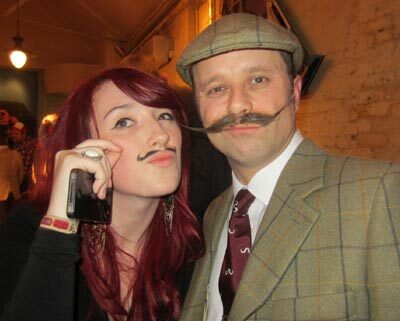 Moustache fan Rhiannon Devaney with the Sec. 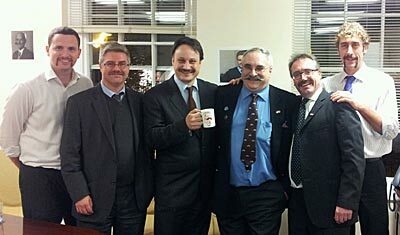 Some of the Mo Bros couldn't wait to get their 'taches off! 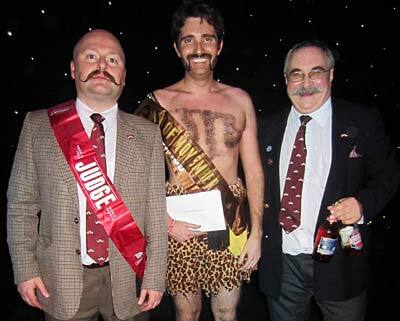 The judging team of Dawn from Fullers, Jenny from Movember, Dylan Jones editor of GQ magazine and myself, presided over a parade of fabulous taches. 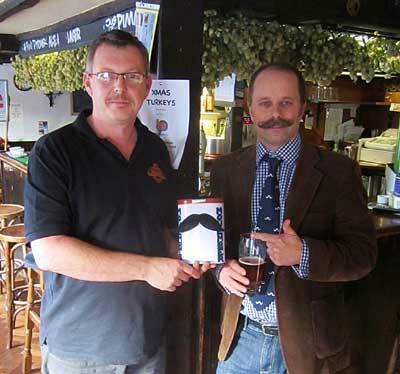 However there could only be one winner of the coveted title of Fullers' Tache of Movember and that was Nigel Parrott - who also raised over £1000 in the process - thanks Nigel, and congratulations! Chris Agate, (below, third from the left in the black cowboy hat) old school mate of our Secretary has sent in this line-up of Mo Bros from guess where? Wrong! 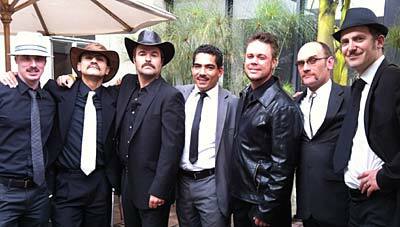 Chris has taken Movember with him to Bogota in South America! 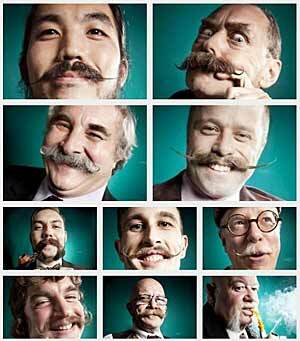 Please let us know if you have been doing anything for Movember.